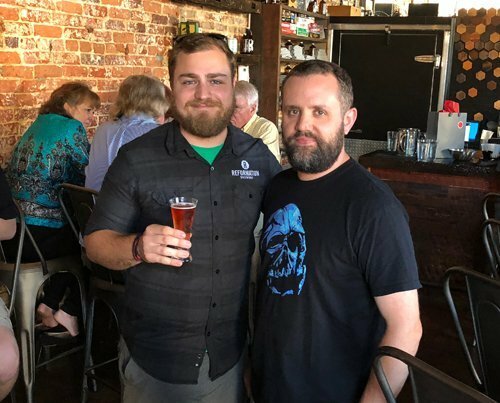 The Hive celebrated its 3rd anniversary with a Reformation Brewing Tap Takeover. They called it “May the Fourth Be With Brew” So if you figured it out it will be a Star Wars theme affair. The idea for the Star Wars theme came from Reformation Brewing which has done about 10 of them across the state. There was a Light Side and a Dark Side to the takeover. (a very new brew); Sabine “The Seeker” Saison; Oren “Wan Kenobi” IPA; Haddy “Solo” Wit and “Jedi” Jude Tripel. On the Dark Side: Nolan “The Wanderer” IPA: “Death” Stark Reserve Porters; “Sith” Cadence Dubbel; Barrel-Aged “Sith” Cadence Reserve Dubbel and Declaration “Destroyer” Stout. Stay tuned for more details about this great takeover. Mrs. Dan and I bought 5oz pours of all ten and want to share our notes. When: Friday, May 4, 2018. 5 until closing.